ALPHA is an international collaboration based at CERN, and which is working with trapped antihydrogen atoms, the antimatter counterpart of the simplest atom, hydrogen. By precise comparisons of hydrogen and antihydrogen, the experiment hopes to study fundamental symmetries between matter and antimatter. The ALPHA collaboration has for the first time observed single-photon excitation of antihydrogen atoms from the ground (1S) state to the 2P state using 121nm pulsed laser light - the so-called lyman-alpha line of the Lyman series. The results were published in Nature on August 22nd 2018 and also demonstrate how the pulsed laser-light can be used to measure the temperature of the antihydrogen atoms. The single-photon lyman-alpha transition takes ALPHA one step closer to laser-cooling of antihydrogen, a feat that would dramatically improve the potential for more precise measurements of the also recently detailed 1S-2S transition as well as measurements of the gravitational influence on antihydrogen. The expansion of ALPHA to do the latter in ALPHA is currently underway. Our latest breakthrough, the first detailed study of one of the hyperfine components of the 1S-2S line in trapped antihydrogen has been published in Nature and is the most precise and most accurate measurement of antimatter to date. This builds on years of work, developing techniques to manipulate super-cold antiprotons and positrons, create trapped antihydrogen and detect the very few atoms that are available to the experiment. It is another crucial step towards precision comparisons of antihydrogen and hydrogen. Directly measuring if there are any differences between the antimatter partners may help us understand why our Universe is made almost entirely of matter, even though matter and antimatter should have been produced in equal quanitites in the Big Bang. In our experiment, we trapped antihydrogen atoms in our magnetic trap and illuminated them with laser light with a wavelength close to 243nm. In four series of runs, we tuned the light so that it was positioned in a number of different places relative to the calculated resonance with the 1S-2S transition in hydrogen. If the light excites the antiatoms to the 2S state it has a good probability for getting photoionised by subsequent photons and thus be lost from the trap. By repeating the experiment for a number of different frequencies we could map out the resonance position of the transition and it's shape. In each run, after 300s of illumination, we counted both the number of atoms escaping during illumination and remaining in the trap following illumination using our annihilation imaging detector. In total we did four sets of four frequencies each, using about 4000 antiatoms in each set, composed of about 21 individual runs. Each run stacked antihydrogen from 3 mixing cycles of positrons and antiprotons. Combining these four sets allowed us to extract a value for the centre frequency of 2 466 061 103 079.4 (5.4) kHz, to be compared with our calculation for hydrogen in the same magnetic field of 2466 061 103 080.3 (0.6) kHz. We thus found that our measurement of antihydrogen was consistent with the expected value for hydrogen to a precision of about 2 parts in 10 to the power 12. While this is still about 3 orders of magnitude short of the state-of-the-art in hydrogen, it is nontheless the most precise and accurate measurement done on any antimatter system to date. 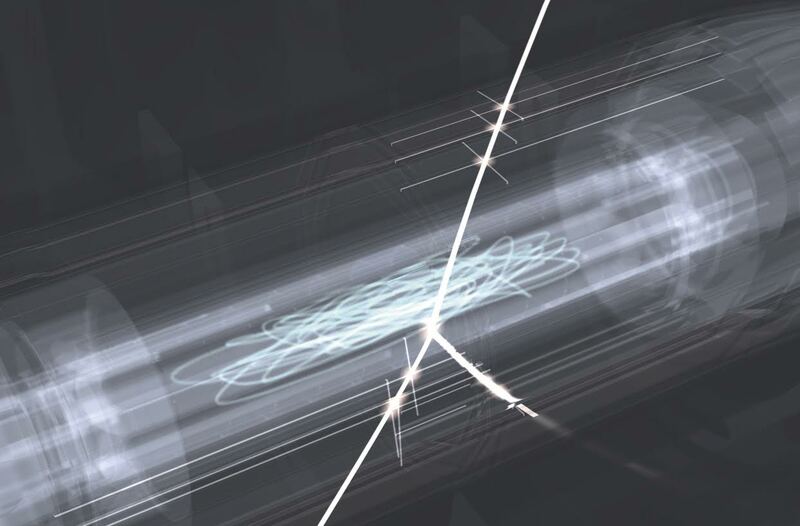 Following 30 years of effort by the low-energy antimatter community at CERN, the ALPHA collaboration has made seminal measurements of antihydrogen’s spectral structure in a bid to test nature’s fundamental symmetries. 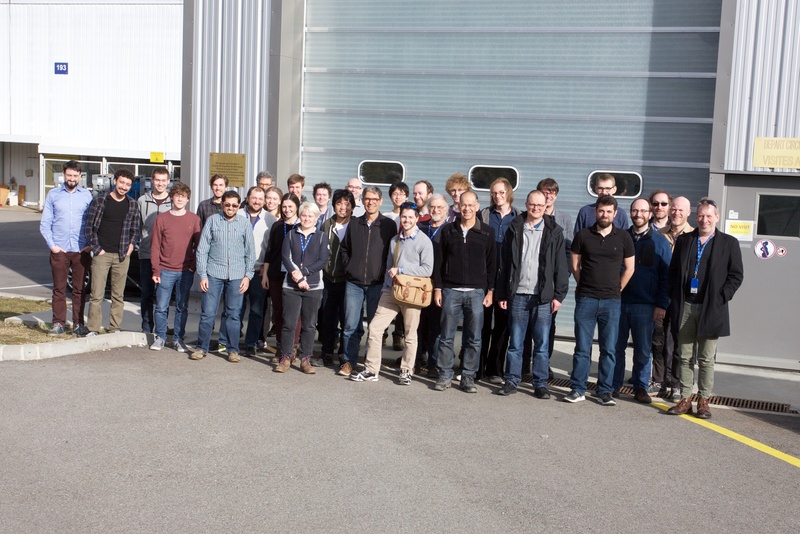 Participants in ALPHAs annual collaboration meeting at CERN. Our latest breakthrough, the first observation of the 1S-2S transition in trapped antihydrogen has been published in Nature and is the first time a spectral line has been observed in antihydrogen. This builds on years of work, developing techniques to manipulate super-cold antiprotons and positrons, create trapped antihydrogen and detect the very few atoms that are available to the experiment. It is another crucial step towards precision comparisons of antihydrogen and hydrogen. In our experiment, we trapped antihydrogen atoms in our magnetic trap and illuminated them with laser light with a wavelength close to 243nm. In one series of runs, we tuned the light so that it is in resonance with the 1S-2S transition in hydrogen, and in a second series, so that it was detuned by 200 kHz. Interactions between the laser and the trapped atoms should cause atoms to be lost from the trap. In each run, after 600s of illumination, we counted the number of atoms left in the trap using our annihilation imaging detector. When the laser was tuned to resonance, we observed 67 atoms in 11 runs; when the laser was detuned, we counted 159 atoms in the same number of runs. We also searched for signs of the atoms annihilating as they left the trap while the laser illuminated. When the laser was on-resonance, we observed 79 events that pass our criteria for inclusion, and 27 when off-resonance. Both of these comparisons help us conclude that the on-resonance laser light is interacting with the antihydrogen atoms via their 1S-2S transition. This first result implies that the 1S-2S transition in hydrogen and antihydrogen are not too different, and the next steps are to measure the transition's lineshape and increase the precision of the measurement. Watch out for more exciting results over the next few years! This item in the news!